Roger Ebert: When "The Sweet Smell of Success" was released in 1957, it was seen as a thinly-veiled attack on Walter Winchell, who for decades had been the most famous and reviled gossip columnist in America. Forty years later Winchell is mostly forgotten (he died in 1972), but the film lives on--sharp-edged, merciless. The performances by Burt Lancaster and Tony Curtis have not dated or grown soft; although both men were dismissed as studio stars at the time, can we think of a "serious actor" who could have played either role so well? Deep Focus Review: Released during the decline of cinema’s Golden Age and amid HUAC (House Un-American Activities Committee) witchhunts, the film defied media moguls of the period and scoffed in the face of capitalist powers in a time when anti-establishment thinking brought suspicion. With witty scorn whose insolence entertains, few films have such unlikely Hollywood origins, yet many that took the same risks as Sweet Smell of Success, with time, became treasures of the cinema. Regardless of the film’s box-office failure and initially mixed reception, time has allowed the picture’s reputation to grow. Winchell’s reign deteriorated after the film’s release and authority shifted away from those in power who took offence, thus it became easier and safer to openly identify and support the wonders of the film’s harsh but comic cynicism. NPR.org: If anything about Sweet Smell of Success feels dated, it's precisely the notion of a single all-powerful columnist. The world Winchell created has grown ever more democratic; gossipmongers are now as inescapable as people staring at their smart phones. Thanks to Facebook, Twitter and YouTube — which recently brought down designer John Galliano by capturing his anti-semitic blather – anybody can be J.J. Hunsecker, which means that nobody is. After all, who needs a Winchell when a teen idol like Twilight's Robert Pattinson enters a restaurant and other diners instantly start Tweeting about where to find him? These days the press agent's job is often less about getting clients noticed — heck, there are people who spend their lives writing about reality TV stars — than about trying to control how they're noticed. It's a near-impossible task, especially if your client is Charlie Sheen. A.O. Scott Critic's Pick Video Review. This shows up pretty regularly on TCM (in fact, I think it was on last week). It can be a bit difficult to watch at times because it is so strongly of its time, as is the acting (I mean, neither Lancaster nor Curtis have ever been accused of subtlety.) I think it's best to watch Sweet Smell... as if you're peering into a time capsule. The real star of the movie, though, is all of that gorgeous location filming of New York. This story is really screaming for a contemporary update. I think it's hard to connect with the idea that a columnist could wield such enormous influence--that really does feel like a relic from a much, much earlier time. I wonder how it could be updated given the much more fractured nature of media today. In Hunsecker's era, few people had a platform and his voice was supreme among those few. In today's era, everyone has a platform, they're just fighting to be heard above the noise. If you work in show biz, the all-powerful columnist isn't such a stretch. Think Nikki Fink or TMZ. visually, the film is stunning. I watched this a few years ago, and found myself wondering if there is a guide to the specific locations used. I thought I was familiar with midtown, but almost nothing looked like a place I recognized. I don't know that it's all that difficult to understand as we watch Brian Williams get mauled by tigers. I don't see the film as an indictment of one powerful columnist so much as of the press generally, wrapped tightly in melodrama and lit for film noir moral relativism. I think that's as relevant as ever, even if the film seems of another era. Another film from 1957 many have not seen that I think is also startlingly relevant is A Face in the Crowd [the A.O. Scott video]; Andy Griffith, Patricia Neal, and Walter Matthau star. Both films are grappling with the new, fearsomely powerful mass media, and place it antagonistically against both the little guy and temptingly pliable to powerful and monied forces. I don't think those issues have really disappeared, they've just changed character. I've become a more intense fan of Burt Lancaster as I've come to realize his journey out of the studio system and into a creative and political exile in Europe. He's really superb in this role, and of course Curtis is terrific as well (I like him better here than in his comedy persona). I knew of this film but didn't see it until a few years ago and it's one that I wish I had seen a lot earlier. It's uncompromising and uncomfortable, in a kind of a Douglas Sirk way, if that makes sense. 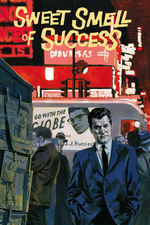 The Dissolve had a great piece: Sweet Smell of Success and the moral tarpit of show business. If the social satire here appeals, I can also recommend Mackendrick's biting The Man in the White Suit. computech: On the Set of New York; Movie Locations.